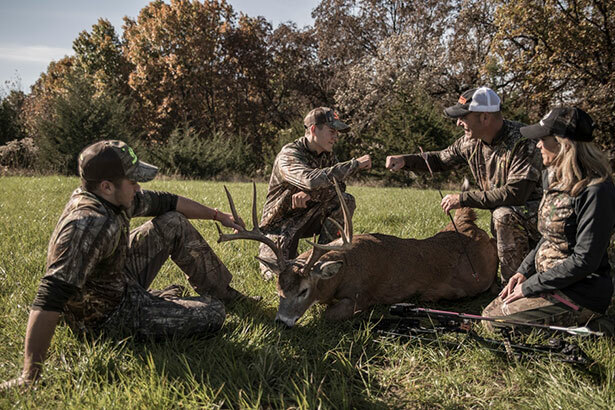 Deer hunters live for hunting the cool autumn months, but sometimes reality brings unusually warm and dry conditions to the deer woods; what should a hunter do despite the weather? When it comes to the autumn months, there are a number of times when warmth is good. From the sultry days of early autumn as the heat drives mourning doves to a dwindling waterhole to the steaming goodness of hot apple cider at a pumpkin patch with the kids, sometimes, a little extra heat can be a good thing. But rarely - if ever - will you hear a serious deer hunter wishing for more warmth in the autumn season. David Holder, the Iowa based co-host of Outdoor Channel's Raised Hunting television show, is one of those hunters who typically grumbles at warm fall weather. "Yeah, I'm normally pretty grumpy when the weather is really warm like it has been so far this fall," chuckled Holder. But after the way that a recent hot weather hunt turned out for Holder, he might be changing his tune. "Yeah, in late October (of 2016), I shot my largest Iowa whitetail ever," said Holder. "In fact, that particular day, it got really hot." Like the thermometer soaring into the upper 80s, in the middle of Iowa and in the middle of fall no less. "If there was a saving grace, it was that the wind picked up a little bit," said Holder. 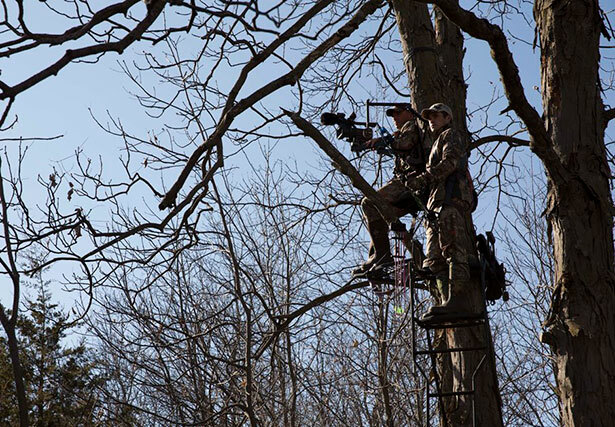 Even so, Holder admits that he was pretty glum sitting in his Hawk treestand on such a warm afternoon at a time of the year that he regards as deer hunting's primetime, the days when the pre-rut begins to kick into gear. 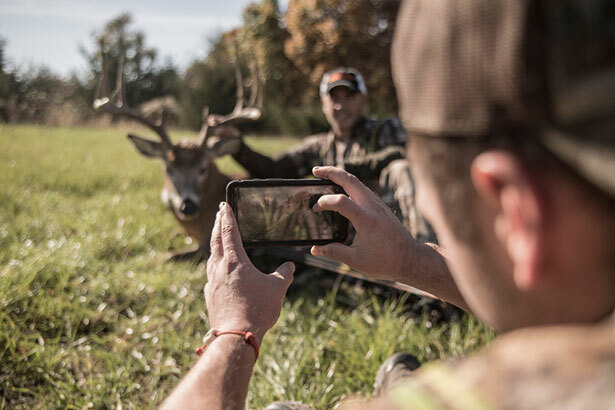 Knowing that despite the heat, nature still had to be taking its course, David decided to turn things up a notch or two by playing one of his aggressive pre-rut hunting cards. "I picked up the horns and rattled," said Holder. "Some people might have said that it was too early to rattle, but I thought I didn't have much to lose. "I've learned over the years that if I don't have my calls and rattling horns in my hands, then I have no chance and nothing to throw at a deer that might show up around 100 yards away." That being said, Holder admits that he rattles conservatively when the pre-rut is in its infancy. "When rattling at that time of the year (when they are transitioning from food to the pre-rut), I'm not crashing the horns together like you would to simulate a major fight," he said. "But I do rattle a bit longer with more pushing and shoving sounds. "Earlier in the year, I might rattle for a minute or two, trying to simulate two younger bucks that are sparring with each other, trying to figure out which one is going to be more dominant." Does such an early rattling technique work, especially when it's red-hot outside? Holder smiles and says that it sure did in this particular instance as he spied a deer off in the distance in the direction of a planted food plot. "I told my cameraman that I could see the deer, but I couldn't make out what he was," said David. "He might be a 100-inch deer or a 200-inch deer, I just didn't know." Not long after that sighting, a doe came in. With the doe acting a little edgy, Holder and the cameraman froze and waited her out. When the doe calmed down and sauntered by, Holder looked up and found that the buck he had seen at a distance was closing at a slow but steady pace. "I turned and there he was as he came walking in," smiled Holder. "Although he had that look in his eye, it still took six or seven minutes before he made his way (fully) in. "But he eventually walked right up to that tree I was in and I shot him at six yards (with my Bear bow)," he added. "The buck went 75 yards, if that, and fell over dead about 50 yards from the stand." "When we recovered him a short while later, it didn't take long to figure out that he was my best Iowa buck ever," said David. 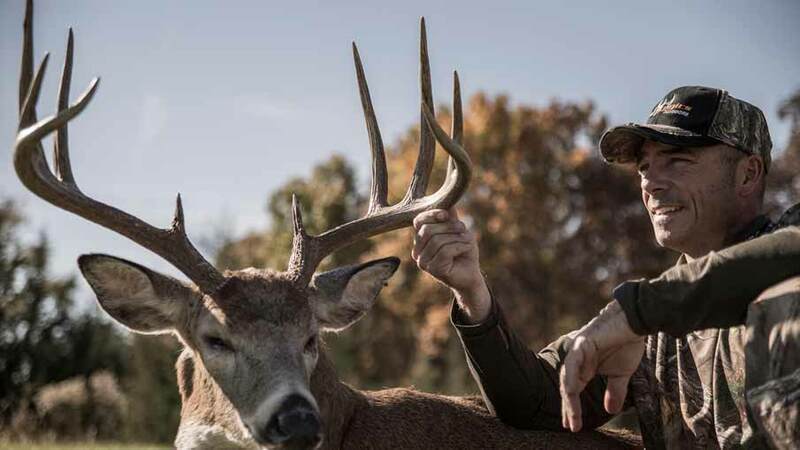 "He taped out at 161 inches as a 10-point that was 22-inches wide. We think he's four years old or more because we have a little history with this buck." What lessons are there to be learned from Holder's superb Pope & Young Club qualifier? First, a major lesson to learn is not to let the warm conditions defeat you before you even climb up into a tree. "My thought process, which I tell to my grumpy husband sometimes, is that there is absolutely nothing we can do about the weather," laughed David's wife Karin. "I tell him that all the time, that you can't change the weather, so quit talking about it and just go," she added. "The deer still have to eat, they still have to move and they still have to breed. When it's hot, it might be miserable for us as hunters, but the deer still have to do what nature calls them to do. So we have to work to put ourselves in the right place to catch them moving." It's a lesson that David Holder is slowly - pardon the pun - warming up to. "Yeah, she's right, you still have to go," he said. "At this time of the year, you really don't have a choice - it's go time. And I guess I'd always rather have a bad weather day to go hunting than to spend a day cooped up in the house. So hot weather or not, I'm going to go." Second, David notes that a hunter will likely need to adjust the stand locations that are being hunted. In this case, his stand was situated between two food sources and not too terribly far away from the deer's bedding area. "You do have to adjust your stand locations a little bit when it's hot," said Holder. "You want to back off of the food sources a little father back into the timber, what we all call staging areas. "Why? Because it's cooler back in such spots and it just doesn't seem like deer, especially in the evenings, will move to food sources as quickly (when it's really warm)." Similarly, don't be afraid to sit over a waterhole when the red liquid in the thermometer is rising. "Any kind of water source that it is not just out in the wide open like a lake is, those can be good," said David. "We have one place, a pond in the timber, and we really like to sit that spot (as the) rut (approaches and gets going). "At that pond, you're going to see a lot of deer period, but when it's really warm like it has been so far this fall, that's a really good spot for bucks and does to come in and get a really quick drink." What's the third lesson from this hunt? Well, while Holder did find his most recent success later on in the day, he admits that usually, earlier in the day is better when conditions are ultra warm. "It cools off overnight and stays cooler that first hour or two each day, so much so that bucks are often still up on their feet walking around (for awhile)," said David. And sometimes, especially as the rut approaches, bucks will start to stay on their feet even longer in the morning hours. "A couple of weeks ago, Karin and Easton were filming a hunt and they didn't see much moving on that particular morning," said David. "In fact, they got down out of their stand at 10:15 a.m. as the temperature was really beginning to go up. "But a little more than an hour later, around 11:30 a.m., we got some trail camera photos of a great buck walking in front of their stand, working a scrape and then walking off." None of this is to suggest that David and Karin, along with their sons Easton and Warren, relish hunting hot weather stretches in the fall. It's just that they try really hard not to let such conditions defeat them since chances at Midwestern big bucks can still be had. Even the biggest buck of one's hunting life. "I guess what I'm saying is that every condition I would like to have (in the fall) was wrong (on that particular hunt), but it still worked out," smiled Holder. Indeed it did, despite weeks of record autumn warmth in the heart of Iowa. And David Holder has got the hefty taxidermy bill to prove it all.